Having recently returned from some travel, and having just spent time with some seldom seen friends over the holidays, I am reminded that there are certain travel-related questions that I am asked again and again. It only makes sense, therefore, that I share with all this short list. Presented for your enjoyment, here are the four questions I am, by far, most commonly asked. 1. How do you afford it? This is a two part answer. First, travel doesn't have to be expensive, it depends on how you do it, and where you go. 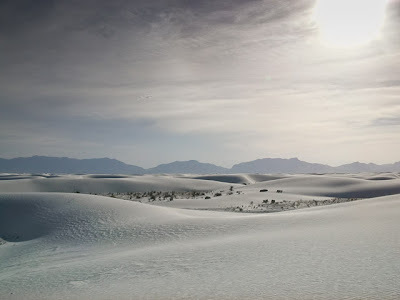 We think of travel as being a luxury, but traveling almost anywhere in the world is far cheaper than living in San Francisco, my current home. I recently spent three and a half months traveling around the US on a ship, and I was actually paid. Not much, by any means, but enough that I had more money at the end of it than I had at the beginning. Even when you're not being paid to travel, it doesn't cost much if you do it right. I'm speaking very literally when I say that you can buy a train ticket from one side of China to the other for less than it costs to fill the tank of your SUV. Speaking of SUVs, here's part two of the answer: I've simply made different financial priorities for myself than most of my peers have made for themselves. I've never bought a house or a car or a baby. Don't get me wrong, I love houses and cars and babies, I may well get some for myself some day. But the fact that I haven't yet means that that money is available for other things. It's important to note that part one of the answer is vastly more important than part two, and that you shouldn't consider a house or a car or least of all a baby to be an impediment to travel. If you are genuinely so inclined, you can rent the house, sell the car, and bring the baby. 2. How do you manage when you can't speak the language? You mean like in Kentucky? Actually, when I was on the ship, we were in Kentucky at one point (if you're wondering how we managed that, find the Ohio river on a map), and a couple who had come on board to visit the ship asked me where we were headed next. I said "Louisville," except what I actually said was, "Loovuhl." "Aw, look," the woman said to her husband, "he's trying to say it right." Seriously though, here's the thing: English is (ironically enough) the lingua franca of the world. If you speak English, you're pretty much golden. You know what Esperanto was supposed to be? That's what English is, except it's harder to learn and has no internal consistency. The sheet iron inside type beef, or the loose fruit corn? So many choices. The more the economy of a place is dependent on tourism, the more people speak English. This means that in Japan, where everyone is highly educated and a minimum of six years of English are required in school, no one speaks English, because they have computer companies, and car factories, and a stock exchange. But in remote mountain villages in Nepal, illiterate children will come up to you and say, "Hi, what's your name?" And when no one speaks English, it's just not that hard to learn what you need to know in order to get by. With a very limited number of phrases you can get a bed in a hotel, food in a restaurant, and a ticket on a bus. Granted, that won't make you a scintillating conversationalist, but it'll get ya by. The fact is, in most places in the world, people are ecstatic if you simply make an effort, and they will bend over backwards to understand you, and be understood. When I was on the trans-siberian railway for seven days, the woman who ran the dining car actually resorted to drawing pictures for me. I think she felt sorry for me, after watching me sit there with my phrasebook for 20 minutes each night at dinner, decoding Cyrillic. By the way, get a phrasebook. By far my favorite are the Rough Guide phrasebooks, though the reasons why would be a blog post unto themselves. 3. Do you ever get lonely? Being alone is like playing the piano, or solving mathematical equations, or cooking, or any other skill: there may be some people who are predisposed to be better at it than others, but we can all get better with practice. I'm pretty good at being by myself, and have gotten less and less prone to loneliness as I've traveled by myself more. This is not to say that I never miss being with someone. I love conversation, and once, in Russia, I went about three weeks without meeting anyone who spoke English. When I finally met another American, in Irkutsk, I did pretty much nothing but talk his ear off for three days. And there's a strange psychological phenomenon whereby it feels less likely that you might die (even if it's not) when you're with someone else. So, when I was occasionally in a frightening situation, I missed the psychological comfort of a compatriot. And of course some things are just better appreciated with another person. Lonely? Wadda ya mean, lonely?" But being alone while traveling also has tremendous advantages. The obvious is that you can do what you want, when you want, without worrying about someone else's agenda. But less obvious, and vastly more important, is the fact that when you are by yourself, you're much more approachable. Look, you want to meet people, right? When you're with someone else, there's an insular little bubble around you (the same bubble that protects you from the thought that you might actually die) and other people bounce right off of it. Other travelers can sometimes pierce the bubble, but it is impervious to locals. You can go to Angkor Wat with your honey and you'll have a wonderful time, I promise. It's an incredible sight, and you can explore it for days. But what will not happen is that you will not meet Lai. Lai is a Buddhist monk at the neighboring monastery, where he has lived since he was 10. Lai will not say hello to you and offer to give you a tour of his monastery. He won't lead you around and explain to you the details of the murals depicting scenes from the life of Buddha. I feel fairly confident that none of this will happen, because when I asked Lai if he often spoke with tourists he said, "No, almost never." When I asked why, he shrugged and gave an embarrassed smile, and then said, "I'm too afraid to talk to more than one person." Lai is not alone, so you might want to be. 4. What is the best/worst/weirdest thing you've ever eaten? Before I started traveling, I'd been quasi-vegetarian for eight years. "Pescetarian," perhaps I should say, since I always ate fish. But when I started traveling I gradually eased back in to eating, well, everything. There were a number of reasons for this (not least, that I wasn't always in a position to be picky), but I think the most important reason is that food is just an incredible part of the culture of a place, and I didn't want to miss out on the myriad manifestations of something so fundamental. Tiny birds are delicious with Coke. Happily, I like everything, which makes it a lot easier to order in a restaurant when you can't read the menu. Of course there are some things I like more than others, but I don't think there's anything that people actually eat, that I wouldn't eat. In all of my traveling, I've only ever once refused to eat something. I was in Laos, and was sitting with a group of Laotians who were all spooning up bites of something red and glutinous, and when I was offered a spoon I said, "Is that…?" "Duck blood! Very good!" That may well be, but this was at the peak of the avian flu scare. 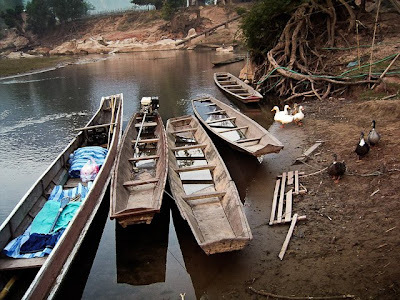 There were no statistics available for Laos, but in neighboring Vietnam, 98% of ducks tested were infected, and the consumption of raw duck's blood was the number one vector of bird to human transmission. I declined, and not only that, I suggested that they might not want to eat it either, knowing full well that they would laugh at the squeamish foreigner, which they did. But I felt I'd done my moral duty. But unless I think there's a good chance it might kill me, I'll eat it. 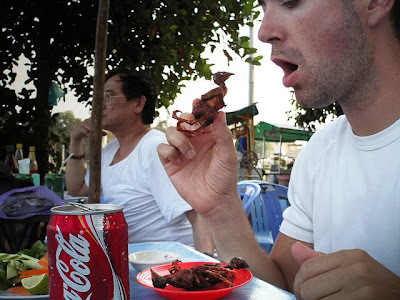 I suppose the weirdest thing I ate might have been deep fried scorpions in Vietnam. As I was about to pop the first one into my mouth, my waiter hastily reached out to stop me, and pulled the scorpion's stinger off the tip of its tail. In Australia I ate kangaroo, which apparently gets very tough if you cook it too long, and it was served almost raw. I do like pretty much anything, so I don't really think there's a worst, but airag does stick in my mind (and throat). It's a drink of fermented horse milk, served in Mongolia, and while I'm sure it's a delightful acquired taste, I was having to hold my breath as I drank my second bowlful in one sitting. 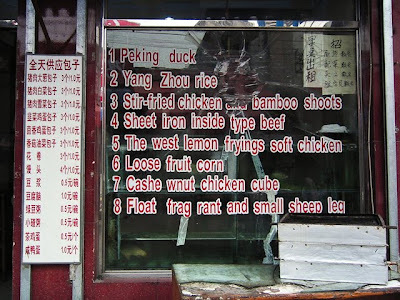 As for the best, that's a long list, but the very first thing that pops into my head is Peking Duck (or would that be Beijing Duck these days?). It might not be very exotic, but it was absolutely amazing every time I had it in Beijing, and I've not been able to find its equal here in the States. And one of the best things I've ever eaten was green curry chicken, which I made myself at a cooking school in Thailand. It might not be that it was really so exceptionally good, as it was simply that I was flabbergasted to discover that something I'd made myself tasted just like the real thing. Have any questions you'd like to see added to the list? Leave them in the comments. 'Being alone is like playing the piano...' -- I identify with this statement but because of other reasons. And look at you, pre-beard! You wrote: "You know what Esperanto was supposed to be? That's what English is, except it's harder to learn and has no internal consistency." Esperanto is still alive and kicking and is of great use to the traveller. I love Esperanto, conceptually, and I'm glad that it is at least limping, if not kicking. But... estimates place the number of Esperanto speakers at somewhere between 100,000 and 2 million, which means that even at the high end of that estimate, you're more than twice as likely to bump into someone who speaks, say, Norwegian, or Mongolian, and 900 times as likely to meet someone who speaks English. About an hour outside of Louisville. And my family reeeeesemebles that remark! I am glad to hear you are back out there. The wife and I are going to South Korean to teach english in Aug and it can't get here soon enough. Been in Ky way to long. It will be a first for us, living over seas. I am very excited. I think you might have mentioned once that you'd been a vegetarian/pescetarian, especially before traveling on the ships. I was a vegan for a little while, then switched to pescetarian, then dropped it altogether. Here in the Midwest it is hard to support such a lifestyle when fresh things only grow during a short period of time, and seafood is hard to come by on a tight budget. I'm hoping to try again once I move to a warmer climate.